Euroleague Basketball is pleased to announce Bojan Dubljevic of Valencia Basket as the back-to-back winner of the Eurocup Rising Star Trophy. 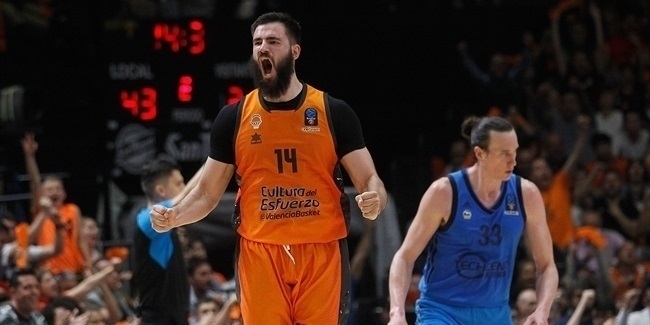 The 22-year-old center is the first man to win this award twice, after posting career numbers this season and helping Valencia become the first club in competition history to reach the Eurocup Finals four times. The Eurocup Rising Star Trophy recognizes the most outstanding player in the competition who was younger than 22 years of age on July 1 of the summer before the season started. Dubljevic, who turned 22 on October 24 of last year, missed a month during the regular season with a dislocated left shoulder, but was instrumental before and after the injury with an inside-outside game that opened up opportunities for his teammates while displaying a veteran’s poise in clutch moments. Despite coming off the bench for all but one game this season, he ranked second on his team in scoring (14.2 points per game) and index rating (16.4), while grabbing a team-best 5.9 rebounds and shooting 48% behind the arc – all of which are career-best numbers. Dubljevic accumulated career-highs in steals and blocks, too, making him a deserving choice as the 2013-14 Eurocup Rising Star! The Rising Star Trophy is part of an expanded awards structure launched before the 2008-09 season to enhance the recognition of the finest Eurocup players for their efforts on the basketball court throughout the season. Apart from the Eurocup Rising Star, Euroleague Basketball and its in-house experts also select the All-Eurocup First and Second Teams and the Eurocup MVP. 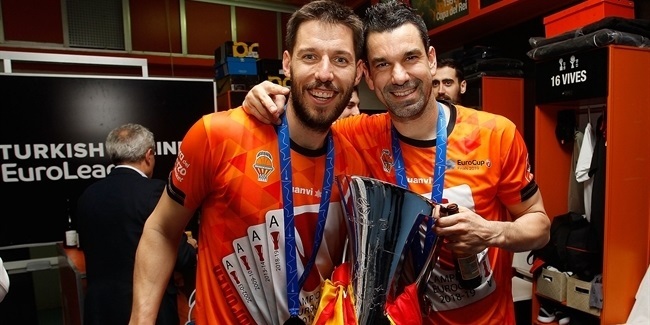 The Eurocup Finals MVP will be announced following Game 2 of the finals. Dubljevic started the Eurocup campaign strong. He averaged 13.5 points in his first two games before a shoulder injury in Regular Season Round 3 forced him to miss a month of action. Upon returning, his 17.0 points and 6.0 rebounds per game helped Valencia win the last two regular season games and clinch a ticket to the next stage. The big man starred in the Last 32, leading his team with a series of impressive performances, including a career-best night as well as a pair of double-doubles, en route to the team-highs of 16.7 points, 7.5 rebounds, 1.0 blocks and an average performance index rating of 20.8 in that stage. Dubljevic collected 18 points plus 12 rebounds against Telenet Ostend to open the Last 32, and had 20 points plus 12 rebounds in a home loss against Unics Kazan to finish it. However, it was a brilliant display in a 64-84 road win at Ostend in Last 32 Round 5 that was his best performance of all. In a clash Valencia had to win, Dubljevic posted a career- high index rating of 37 by collecting career-highs of 26 points and 4 steals in addition to 9 rebounds. Dubljevic followed that with a pair of double-digit performances in the eighthfinals against Khimki Moscow Region, including a game-high 23 points in the decisive return leg in Moscow as Valencia advanced with a 157-156 aggregate win. In the quarterfinals, Dubljevic helped his team breeze past Alba Berlin with 10.5 points and 5.5 rebounds, before another one of his memorable performance came in the semifinals. Dubljevic amassed 24 points plus 12 rebounds in an 84-75 win over Nizhny Novgorod, a performance that landed him Semifinals Game 1 MVP honors, before helping Valencia punch a ticket to the finals with 13 points and 6 rebounds in a huge road win in Nizhny Novgorod. With Dubljevic winning the Eurocup Rising Star Trophy for the second time, he headlines the list of previous winners that also includes Victor Claver of Power Electronics Valencia, Milan Macvan of Hemofarm Vrsac, Donatas Motiejunas of Benetton Basket Bwin and Jonas Valanciunas of Lietuvos Rytas . 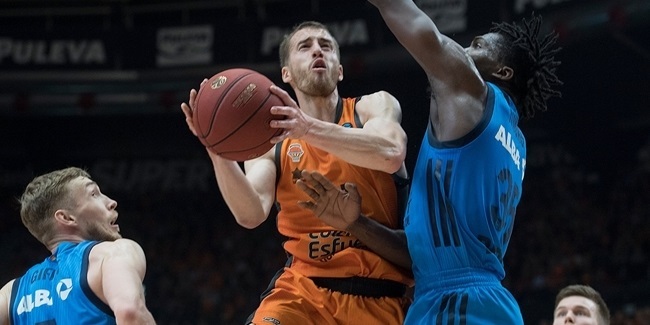 Now Dubljevic aims for another trophy, that of Eurocup champion, as he tries to help Valencia Basket reach the winners' podium in the two-game Eurocup Finals series against Unics Kazan.